All In...Convenient Deeded Beach Access, Large Heated Pool, Event Friendly! “All In” is located on a quiet dead end street in Seacrest, Florida. It is near to both Rosemary Beach and Alys Beach. This 6 bedroom, 5 bath home has been completely renovated and re-furnished and sleeps 17 people. Convenient deeded beach access is just a leisurely walk down the street and across Scenic 30A. The entire back yard is fenced in with lush manicured vegetation and a lovely large, kidney-shaped private heated pool. Great setting for events--up to 50 guests, $500 fee applies. Free wireless internet. On demand gas hot water heating system means you never run out. First Floor: Cool tile floors, ceiling fans and gracious open concept kitchen / dining / living area make for a great family vacation setting. The newly renovated kitchen includes all new cabinetry, granite countertops, central island with 4 barstools, stainless appliances and a pantry. The newly expanded living room features a large sectional sofa, side chair, coffee table and huge 55” Smart LED TV with Blu-ray. French doors from the living room lead out to the pool area. The dining area includes a fireplace as well as 2 tables – one that seats eight and another tall table with 4 chairs. King bedroom has a bedside table with lamp, dresser, closet, 32" HDTV and adjacent bath with tub / shower. This bath also serves the living area. There is one more bedroom on this level with a queen bed and a twin daybed that has a 40" Smart HDTV, 2 bedside tables with lamps, dresser, closet and a private bath with shower. Laundry room off kitchen. Second Floor: There are 4 bedrooms on this floor. The king master bedroom has 2 bedside tables with lamps, dresser, seating area with 2 chairs and a 40" Smart HDTV as well as a new private bath with walk-in shower and a closet. The queen bedroom is outfitted with 2 bedside tables with lamps, closet, dresser with 32" HDTV and new private bath with shower. Bunk bedroom has 2 bunk beds (4 twins), dresser with mirror and a closet. The final small bedroom has 2 twin beds and a dresser. Both of these bedrooms share a hall bath with 2 vanity sinks and a tub / shower. Large kid’s den area with full sized futon sleeper sofa, small twin in den cubby, 2 side chairs, 2 game tables with 2 chairs each and a 42" Smart HDTV, Blu-ray DVD and Wii game system with many games, as well as board games, puzzles and cards. This room opens out to a deck overlooking the street side of the house. 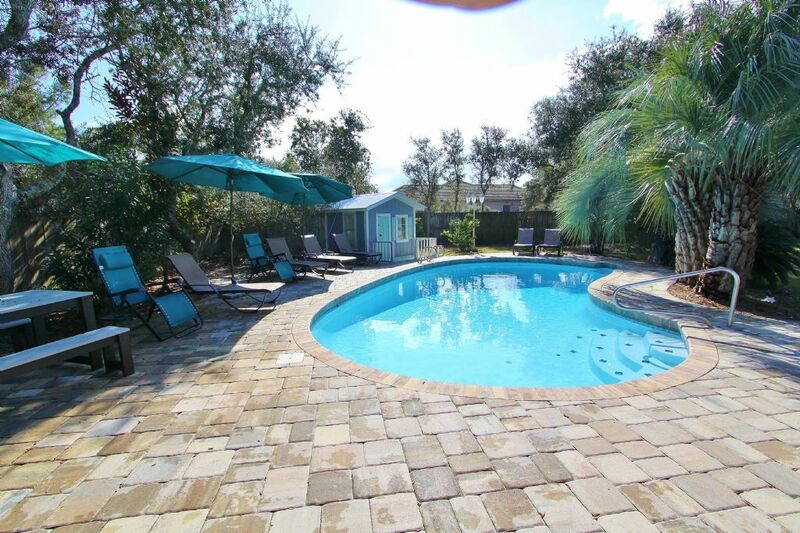 Outside: Private heated pool in large fenced in back yard (fees apply for pool heating). Pool is surrounded by 2 large shade umbrellas, multiple loungers and a large picnic table for outdoor dining. Outdoor fire pit has 4 low slung all weather wicker chairs around it. Stainless steel gas grill. Parking for five cars in the circular driveway and parking pad. This vacation home is absolutely wonderful! The inside is very nice and the pool area is amazing. Thank you for sharing your experience in "All In"--we are so glad you enjoyed your stay. We hope we are able to host you again! We loved staying at “All In”. The house was very nice and clean. The pool area was the perfect size for our family. Also the beach access was close by which was nice. Perfect house for a perfect weekend! Great property! We rented this house for a bachelorette party with 11 women. It was absolutely perfect for what we needed it for. The house had plenty of beds and bathrooms to accommodate all of the girls. Everything was clean and ready for a weekend of fun. The kitchen was stocked with literally everything we could have needed for our stay. There was enough yard space for us to set up corn hole. The pool was beautiful and perfect for lounging around when we weren't down by the beach. The beach is not visible from the house, but was only a short walk away (be prepared for some stairs though). We even got to use the grill which was perfect for some burgers by the pool. Overall the house was exactly what we wanted. Thank you so much for sharing your experience. We are thrilled that you had such a enjoyable stay in All In! We hope we are able to host you again in the future! We had a wonderful family break - 15 of us together in amazing house! Everything set up for perfect break! Perfect location. Beach was NOT crowded. We used the dollhouse to store our beach stuff. House had great decor. Backyard & pool were both large-not your typical FL vacation home size. The house felt like home. Great beds super clean will stocked kitchen. The pool and yard more than wonderful. You will not be disappointed renting this one!